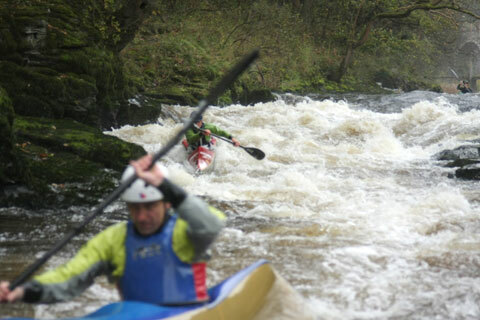 Wild Water Racing: Matt Bishop and Grant Underwood train with Neil Stamps on a white water rapid. This is a bit like downhill skiing, but in a kayak. Wild Water Racing takes place on Grade Two to Grade Four white water, usually in specialised racing kayaks. The best known racing kayaks are called Wavehoppers. Competitors race against the clock, not each other. Wild Water Racing kayaks are designed to be both fast and tough, as the courses are often rocky. The kayaks initially feel very wobbly, but are surprisingly stable once you get used to them. There is a national Wild Water Racing championship with paddlers starting in Division B, before gaining promotion to the harder Division A. Wild Water Races can take ten to 25 minutes to complete, although there are also two minute Sprint events. The Sharks is an active Wild Water Racing London club. Many clubs will own a Wavehopper or two, which can be used by members. Image courtesy of The Sharks. Photograph taken by Kaycee Underwood at Llangollen on the River Dee.